Figworts are tall, flowering plants used as scenery in the three main Pikmin games. In Pikmin, figwort plants sport bright blue flowers. 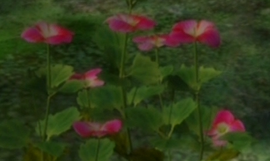 In Pikmin 2, figwort blossoms have adopted a deep pinkish hue which is thought to be the result of differing soil conditions; in fact, the color of some real-world flowering plants, bigleaf hydrangeas in particular, can vary from blue to pink/purple, depending on the acidity or alkalinity of the soil in which they grow. Although Pikmin 2 does not have the tiny black bugs from the first game, figworts may conceal larger creatures such as Doodlebugs or Unmarked Spectralids. In certain above-ground and cave locations, such as the Wistful Wild and White Flower Garden, dead or dormant figworts can be seen, possessing pale or red-orange leaves and without flowers. In Pikmin 3, only the blue figwort plant appears. In the first game, touching certain flower clusters will release a swarm of tiny black bugs sometimes referred to by fans simply as "figwort insects". They fly around for a bit and quickly retreat, and cannot be interacted with whatsoever. These bugs also appear around some clovers, and even in isolated spots, such as behind the rusty can next to the Eternal Fuel Dynamo. No information about them is provided in the game. The plants they inhabit also show no signs of disease, so the relationship between the insects and plants is likely mutualism. Large and small figworts in The Final Trial. Figwort insects at The Final Trial. Red-brown leaves of figworts in Winter. A figwort in the Garden of Hope in Pikmin 3. Veronica persica, the species of plant that figworts are based on. This article was a featured article from October 3rd to December 3rd, 2008. This page was last edited on April 3, 2019, at 16:28.